Supraspinatus is the smallest of the 4 muscles which comprise the Rotator Cuff of the shoulder joint specifically in the supraspinatus fossa. It travels underneath the acromion. Supraspinatus fossa of the scapula. A shallow depression in the body of the scapula above its spine. Greater tuberosity of the humerus, superior facet. Suprascapular Nerve, C5 & 6, superior trunk of the brachial plexus. It abducts the arm from 0 to 15 degrees, when it is the main agonist, then assists deltoid to produce abduction beyond this range up to 90 degrees. As part of the Rotator Cuff, supraspinatus helps to resist the gravitational forces which act on the shoulder joint to pull from the weight of the upper limb downward. It also helps to stabilize the shoulder joint by keeping the head of the humerus firmly pressed medially against the glenoid fossa of the scapula. Supraspinatus is commonly thought to be instrumental in the initiation of shoulder abduction. A study in 2011 used electromyography to study the levels of activity in the shoulder muscles during flexion, and found that supraspinatus was consistently recruited prior to movement of the limb at all loads; the authors concluded that "Posterior rotator cuff muscles appear to be counterbalancing anterior translational forces produced during flexion and it would appear that supraspinatus is one of the muscles that consistently 'initiates' flexion." The Empty Can Test, along with the Full Can Test is a commonly used orthopedic examination test for supraspinatus impingement or integrity of the supraspinatus muscle and tendon. The test is usually easier in sitting or standing. On the side to be tested the one of the examiner’s hands stabilizes shoulder girdle. 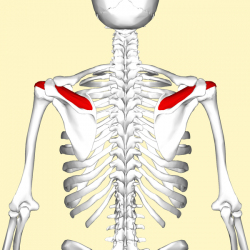 The arm to be tested is moved into 90 degrees of abduction in the plane of the scapula (approximately 30 degrees of forward flexion), full internal rotation with the thumb pointing down as if emptying a beverage can. The examiner’s other hand applies downward pressure on the superior aspect of the distal forearm and the patient resists. Preoperative MRI Shoulder Findings Associated with Clinical Outcome 1 Year after Rotator Cuff Repair. Greater tuberosity angle and critical shoulder angle according to the delamination patterns of rotator cuff tear.